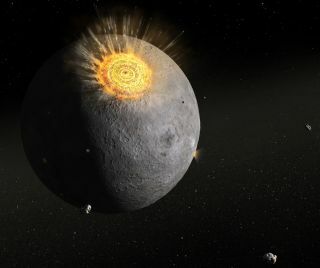 This artist's impression illustrates how the early moon (and Earth) were reshaped by an intense period of bombardment. Asteroids appear to be the dominant impactors. The impactors that pummeled the Earth and moon nearly 4 billion years ago were primarily asteroids, a new study of lunar rocks collected by Apollo astronauts suggests. During a short stretch of time about 3.9 billion years ago, impactors bombarded our planet and the moon at a much higher rate than they do today, dramatically reshaping the surfaces of both bodies. Scientists have long wondered just what these impactors were — asteroids, comets, a mixture of the two or, perhaps, pieces of a destroyed protoplanet. Now, a study of ancient moon rocks brought back to Earth by Apollo 16 astronauts in 1972 has identified the most likely culprit. Astronauts collected this 3.77 billion-year-old ancient regolith breccia at the Apollo 16 landing site. The sample contains fragments of the asteroids that bombarded the Earth-moon system. Joy and her colleagues examined a set of lunar rocks called regolith breccias. In five of these breccias, which consolidated into rock between 3.8 billion and 3.4 billion years ago, they found fragments of long-ago impactors. The team analyzed 30 such fragments with scanning electron microscope and electron microprobe techniques. They determined that these ancient rock pieces strongly resemble carbonaceous chondrite meteorites, whose parent bodies are a certain type of asteroid. Further, they found that the fragments were much more uniform than lunar meteorite pieces from more recent times (from 3.4 billion years ago to the present). This suggests that the space rocks hammering the moon and Earth long ago were different — and far less diverse — than the more modern impactors. While the ancient impactor diversity is relatively low, all of the pieces do not appear to come from the same body, Joy said. So at the moment, the evidence does not point toward a broken-up protoplanet as the single cause of the great "lunar cataclysm." Researchers will keep analyzing lunar rocks to try to get to the bottom of just what happened in our cosmic neighborhood 3.9 billion years ago. "Further studies of lunar samples from other landing sites, and identification of further projectile types, will enable us to statistically assess the diversity of impacting bodies," Joy told SPACE.com via email. Joy and her colleagues report their results today (May 17) in the journal Science. The new study doesn't address what may have caused the increased bombardment rate 3.9 billion years ago. But other researchers have proposed a possible mechanism — the movement of giant planets long ago. The Nice model — so named because its developers were affiliated with the Observatoire de la Côte d’Azur in the French city of Nice — postulates that our solar system's giant planets formed relatively close together, then migrated to their present locations due to gravitational perturbations. These movements shook up the solar system considerably, the idea goes. They led to the formation of the Oort Cloud — the faraway repository of comets — for example, and destabilized the main asteroid belt between Mars and Jupiter. "Collisions increased throughout the solar system; asteroids crashed into one another, large bodies hit the moon and formed the large basins, and tens of thousands of large bodies struck Earth and Mars," Alan Rubin of UCLA writes in a companion piece to the new study, which appears in the same issue of Science. This ancient bombardment — seemingly such a destructive series of events — may have brought the seeds of life to Earth, or somehow helped it get a foothold on our planet. "Because the earliest isotopic evidence for life comes from 3.85-billion-year-old terrestrial sedimentary rocks, it seems plausible that this bombardment also influenced the origin of life on Earth," Rubin writes.